Joe Mason's injury-time goal denied Huddersfield a point with Bolton now unbeaten in their last five away games. Second-half substitute Mason, on loan from Cardiff, drilled home hard and low into the bottom right corner from Lee Chung-Yong's cross following a corner. 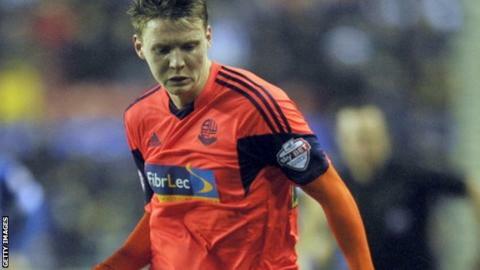 Huddersfield had earlier hit the bar through Danny Ward, while Bolton's Jay Spearing twice cleared off the line. The Terriers, without a win in seven, are 10 points clear of the relegation zone, two behind 15th-placed Bolton. The game had looked destined to end goalless after a host of chances were spurned. South Korean Lee hit the post when unmarked 15 yards out before Ward lashed against the bar, possibly via the fingertips of visiting goalkeeper Adam Bogdan. Lee was also denied a penalty after going down under a challenge from Peter Clarke, while at the other end Bogdan was called on to stop an Oscar Gobern header. Further chances were traded after the break, with home goalkeeper Alex Smithies having to deny Lukas Jutkiewicz and Neil Danns, and Bogdan twice called on by Ward. Bolton felt aggrieved to have another penalty claim rejected when Smithies challenged Jermaine Beckford, but it did not matter thanks to Mason's late winner. "We wouldn't have got this result four months ago. It's been a difficult time but we have always known the answers. "We know [we] have a resolute resilience and commitment among the players and we are playing good football." "We did not defend a set play and that has cost us the point we had. The players have a responsibility to pick up their men and defend. "You have to do your job but we didn't do that, and it's tough to take. We battered them in terms of possession but we haven't seen the game through. Match ends, Huddersfield Town 0, Bolton Wanderers 1. Second Half ends, Huddersfield Town 0, Bolton Wanderers 1. Attempt missed. Joe Mason (Bolton Wanderers) right footed shot from the right side of the box misses to the left. Assisted by Jermaine Beckford. Goal! Huddersfield Town 0, Bolton Wanderers 1. Joe Mason (Bolton Wanderers) right footed shot from the centre of the box to the bottom right corner. Assisted by Lee Chung-Yong with a cross following a corner. Corner, Bolton Wanderers. Conceded by Paul Dixon. Attempt missed. Jermaine Beckford (Bolton Wanderers) right footed shot from the right side of the box misses to the right. Assisted by Neil Danns. Duane Holmes (Huddersfield Town) wins a free kick in the attacking half. Attempt missed. Daniel Ward (Huddersfield Town) left footed shot from a difficult angle on the left misses to the right. Assisted by Adam Clayton. Medo (Bolton Wanderers) is shown the yellow card for a bad foul. Substitution, Bolton Wanderers. Jermaine Beckford replaces Lukas Jutkiewicz. Attempt saved. Neil Danns (Bolton Wanderers) right footed shot from outside the box is saved in the top centre of the goal. Joe Mason (Bolton Wanderers) wins a free kick in the attacking half. Attempt missed. Nahki Wells (Huddersfield Town) right footed shot from the right side of the six yard box misses to the right. Assisted by Tom Smith with a cross. Attempt missed. Duane Holmes (Huddersfield Town) header from the centre of the box misses to the left. Assisted by Nahki Wells. Foul by Peter Clarke (Huddersfield Town). Alan Hutton (Bolton Wanderers) wins a free kick in the defensive half. Corner, Huddersfield Town. Conceded by Adam Bogdan. Attempt saved. Daniel Ward (Huddersfield Town) header from the centre of the box is saved in the top centre of the goal. Assisted by Tom Smith. Substitution, Huddersfield Town. Duane Holmes replaces Oscar Gobern. Attempt blocked. Nahki Wells (Huddersfield Town) header from the centre of the box is blocked. Assisted by Oscar Gobern. Corner, Huddersfield Town. Conceded by David Wheater. Corner, Bolton Wanderers. Conceded by Peter Clarke. Corner, Bolton Wanderers. Conceded by Alex Smithies. Attempt saved. Lukas Jutkiewicz (Bolton Wanderers) right footed shot from a difficult angle on the right is saved in the top right corner. Assisted by Alan Hutton. Substitution, Bolton Wanderers. Joe Mason replaces Liam Trotter. Offside, Bolton Wanderers. Liam Trotter tries a through ball, but Lukas Jutkiewicz is caught offside. Attempt saved. Daniel Ward (Huddersfield Town) left footed shot from the left side of the box is saved in the top left corner. Assisted by Nahki Wells with a through ball. Attempt blocked. Neil Danns (Bolton Wanderers) right footed shot from outside the box is blocked. Assisted by Medo. Attempt missed. Daniel Ward (Huddersfield Town) header from the centre of the box is too high. Assisted by Tom Smith with a cross. Attempt missed. Lukas Jutkiewicz (Bolton Wanderers) left footed shot from outside the box misses to the right. Assisted by Alan Hutton.